Once upon a time, there was a woman called Jo. Life was tough. Divorced with a baby, she scraped by on social security. In between nappy-changes, she would bash out a novel on a big, old typewriter. When it was finished, 12 publishers turned it down. And when she finally did get a deal, she was told to get a day job, as there's "no money in children's books". Well, we all know what happened next. Harry Potter waved his wand, and now J K Rowling is worth a billion dollars. On Thursday, she will publish her first novel for adults, and yet another chapter in an extraordinary life will begin. But for all the pleasure she has given the world, and for all that she deserves her riches, it's hard to feel much love for Jo Rowling at the moment. The arrival of The Casual Vacancy has been more remarkable for showing the ruthless, bullying side of publishing that has become all too common. And, given Rowling's history of litigation, one can only imagine she has done little to discourage it. My colleague, Katy Guest, our literary editor, was asked to sign a non-disclosure agreement before her reviewer could be "hand-delivered" a copy of the book. Embargoes are normal, but within the legalese, Guest found a clause stating that even the existence of the agreement could not be mentioned. A sort of publishing superinjunction. Despite an extensive email exchange with the publisher Little, Brown's lawyers, asking why this was necessary, no comprehensible explanation came. So Guest did the sensible thing and tossed the contract into the recycling, unsigned. Even more absurd, perhaps, was the clause that came with Salman Rushdie's book Joseph Anton, A Memoir, about life under a fatwa. Random House reserved the right to charge €200,000 (£160,000) to anyone they suspected of leaking. They generously reduced this to €175,000 when we asked. Artists are, of course, entitled to guard their intellectual property. And no novelist wants a book's ending to be given away. But the publicity behemoth that precedes Rowling is commercial, not ideological. It's the same monster that sent overbearing letters to fans, ordering them to take down website addresses with the words "Harry Potter" in the website name. Turning authors into brands is nothing new. Publishers will say it's necessary in an industry struggling to cope with narrowing margins. Publishing today is less Tweed and more Snipcock: this castration of literary editors is undignified and rude. But the real losers in all this are the readers. 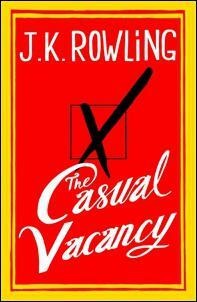 Two million orders are thought to have been placed worldwide for The Casual Vacancy before its release. Yet nobody knows if it's any good. It would be nice to hold up the story of J K Rowling's achievements as a lesson in what anyone with a typewriter and some talent can achieve. But penniless author to publishing despot is not a happy arc. How different it would be if there hadn't been that much money in children's books. I have a slight problem here - there is a huge gap between this post and the one below so you just need to keep scrolling down. Sorry, can't seem to fix it.